June 2012 – Fight Aging! As I'm sure you all know by now, mitochondria are swarming powerplants within the cell, descendants of symbiotic bacteria that bear their own DNA separate from the DNA in the cell nucleus. Mitochondrial DNA provides the blueprints for proteins making up the machinery of a mitochondrion, but it isn't as well protected or as well repaired as nuclear DNA. Given that a lot of reactive compounds are funneled through mitochondria in the processes that keep a cell powered, it is only to be expected that mitochondrial DNA becomes progressively more damaged over time. The range of mechanisms that have evolved to deal with that damage cannot keep up over the long term, and as a result a small but significant portion of our cells fall into ruin on the way to old age, becoming populated by dysfunctional, damaged mitochondria, and causing a great deal of harm to surround tissues and bodily systems by exporting a flood of reactive biochemicals. You can read a longer and more detailed description of this process back in the Fight Aging! archives. So that is one side of the issue of mitochondrial DNA damage and its contribution to degenerative aging - and that in and of itself would be more than enough to make mitochondrial repair biotechnologies a research priority. There are many different potential ways of fixing or rendering irrelevant mitochondrial DNA damage, and allowing mitochondria to continue to function as well as they did at birth for an indefinite period of time. The sooner one of them is developed into a working therapy the better. In aerobic cells the majority of ATP is produced by oxidative phosphorylation. This process takes place in the mitochondria where electrons that are donated from the Krebs cycle are passed through the four complexes (complex I-IV) comprising the electron transport chain (ETC), eventually reducing oxygen and producing water. Many cells operate at a basal level that only requires a part of their total bioenergetic capability. The difference between ATP produced by oxidative phosphorylation at basal and that at maximal activity is termed "spare respiratory capacity" or "reserve respiratory capacity" ... Under certain conditions a tissue can require a sudden burst of additional cellular energy in response to stress or increased workload. If the reserve respiratory capacity of the cells is not sufficient to provide the required ATP affected cells risk being driven into senescence or cell death. In this paper we hypothesize that mitochondria contributes to aging and age-related pathologies through a life-long continued decrease of the respiratory reserve capacity. The decrease sensitizes high energy requiring tissues to an exhaustion of the reserve respiratory capacity. This increases the risk of a range of pathologies that correspondingly are known to be age-related. Through a review of the effects of aging on the regulation of oxidative phosphorylation, we wish to substantiate this hypothesis. In addition, by using brain, heart, and skeletal muscle as examples, we will review how an age-related decrease of the reserve respiratory capacity is implicated in a variety of pathologies in the affected tissues. Cumulative damage to the mtDNA is however, not the only contributor to the age-related decline of oxidative phosphorylation. Transcriptional profiling has revealed different regulation of nuclear genes encoding important peptides for oxidative phosphorylation when comparing young to old. Either way, those mitochondria still need fixing. The biotechnologies capable of that job are on the horizon, and would be coming closer more rapidly if those involved in the work had a greater level of funding. If I mention medical nanorobotics, you might think of the designs put forward by Robert Freitas and others: molecular machines constructed largely from carbon that bear little relation to the cells and cellular system they are intended to interact with. Or you might think of the crude forerunners of those designs presently being tested in the laboratory, such as targeted nanoparticles and nanocontainers used to deliver drug compounds more precisely to where they are needed. But you and I are built out of nanorobots: each of our cells is effectively a structured collection of cooperating, programmable nanoscale robots. They are evolved rather than designed, but still represent a vast preexisting parts library for researchers interested in building the first generation of medical nanorobots. While it is true that there are good reasons for reinventing this wheel, such as gaining far greater performance than is possible from anything similar to our present biology, given that time is of critical importance in developing the next generation of medicine, why not use these existing designs? It seems likely that the first medical nanorobots (well, microrobots in this case) will be highly modified or even completely artificial cells. Why ignore the working blueprint that's right in front of you, after all? Researchers are already building the prototypes, far more advanced than simple targeted nanoparticles. Here, for example, is news of progress towards nanofactories. These are programmable, artificial bacteria-like entities that can be set up to manufacture specific drug compounds in response to their local environment, or to signals from outside the body such as light or ingested chemicals. Scientists are reporting an advance toward treating disease with minute capsules containing not drugs - but the DNA and other biological machinery for making the drug. ... development of nanoscale production units for protein-based drugs in the human body may provide a new approach for treating disease. These production units could be turned on when needed, producing medicines that cannot be taken orally or are toxic and would harm other parts of the body. Until now, researchers have only done this with live bacteria that were designed to make proteins at disease sites. But unlike bacterial systems, artificial ones are modular, and it is easier to modify them. That's why [this research group] developed an artificial, remotely activated nanoparticle system containing DNA and the other "parts" necessary to make proteins, which are the workhorses of the human cell and are often used as drugs. They describe the nanoscale production units, which are tiny spheres encapsulating protein-making machinery like that found in living cells. The resulting nanoparticles produced active proteins on demand when the researchers shined a laser light on them. The nanoparticles even worked when they were injected into mice, which are stand-ins for humans in the laboratory, producing proteins when a laser was shone onto the animals. The sky is the limit once biotechnology really takes off - and we're still in the early stages of this phase of progress. Much more is yet to come. We life in an age of change and rapid scientific innovation in medicine. That in and of itself might be enough to explain why historical actuarial predictions of longevity have been low in comparison to the actual outcome: extrapolation of existing trends tends to do poorly in the face of consistently unpredictable innovation. Nonetheless, a large industry is focused on getting these numbers right, or as close to right as is possible, as vast sums are promised to older folk, either as political entitlements or honestly obligated as a result of insurance contracts. Betting against increasing longevity seems like a fool's game, but nonetheless there is a lot of money to be made in that business - many large entities want to be protected from what is known as longevity risk, the risk that life spans will rise faster than expected and thus financial obligations will spiral out of control. Large entities are willing to pay for that insurance service, and taking on risk for a percentage is very much the core business of finance. In theory the people taking on that risk for a percentage know what they are doing, and they are the ones funding efforts to understand the risk - which in this case means models for future increases in human longevity due to advances in medicine and biotechnology. In practice? The risk gets sliced and diced and parceled out among the players in finance, that much is true. But I'm sure we all see the present results of that undertaking in other large industries, such as housing: when there is enough money involved the business becomes one of lies and politics, the fine art of pocketing profits, taking on unknown risks for short term gain, steering government policies, and raiding the public treasury to cover losses when it all goes south. When buying politicians and policy is a reasonable cost judged against the cost of contracts, buying politicians and policy becomes a part of doing business - and very lucrative, since it allows risk-bearers to try for the upside with the expectation that they will be bailed out if it fails. In 1981, the United Kingdom (UK) Office for National Statistics estimated that male life expectancy at birth would rise to 74 by 2031. It hit that age in 1994. In 2002, the 2031 estimate was 81, but we are now expected to pass that in 2019. This systematic underestimation of official life expectancy increases occurs around the world. It is not an accident. It is deliberate. Politicians put pressure on official agencies to do this, so that the full cost of longevity increases does not fall on them or the current generation of voters. The reason is clear: If more accurate and hence higher projection of life expectancy were produced today, then social security contributions would have to rise now rather than later - and this would be politically very unpopular. The powers that be and their predecessors have accomplished what powers that be always manage in the end: to set up a system of wealth transfers and entitlements that is both unsustainable and stands in opposition to true progress. Thus the modern spectacle of people trying to argue that increases in human longevity are a bad thing! The collapse will come, the promises that cannot be kept will be broken, that much is certain - although it is true that modern innovations in fiat currencies have allowed the game to go on for a good deal longer and become a good deal more destructive than was usually the case in the past. But eventually they will run out of other people's money to loot. Along the way to that end those who are trying to prop up the house of cards will undoubtedly build a great deal more in the ways of lies, waste, and other unpleasantness. SENS Foundation cofounder Aubrey de Grey presented last month at the humanity+ conference in Melbourne, Australia. Adam Ford, the conference coordinator, interviewed de Grey after the event, and later uploaded a slew of video segments from that interview to YouTube. You might take a look at the playlist of a dozen or so videos, divided by topic. The longest of the segments is embedded below; it covers SENS, the research program that aims to repair the root biochemical causes of aging. Those of you who have heard this material before, and who are familiar with the recent updates on work in progress at the SENS Foundation, might choose to browse through the rest of the material instead. The research program that takes us from where we are today, at the dawn of a revolution in biotechnology, to the point at which aging can be controlled through medicine just like any chronic disease is just about as straightforward as scientific research can ever be. The goals are known, the forms of damage to our biology that need to be fixed are known, a list of potential ways to fix them are known. The devil is ever in the details, but this isn't a case of speculative research that has yet to even find the problem it needs to solve. At this point more money means more progress: there is a well defined list of things to work on and too little funding in this field of medical technology to work on them all to the degree that they merit. As such, one might argue that the most important goal for the present is to explain all of this to the world at large, to grow the community of supporters and thus raise more funding. Most people still see aging as a mystery, set in stone, a thing that lies outside the bounds of medicine. Nothing could be further from the truth, but a much larger fraction of the populace must become educated and persuaded that rejuvenation biotechnology is a real, plausible, possible near term goal. Their support is needed in order to build the massive funding institutions and large research communities needed to make rapid progress towards the defeat of aging as the greatest cause of human death and suffering. On the large scale, medicine chases the priorities of the now - and in wealthier regions of the world that has become cancer and heart disease. 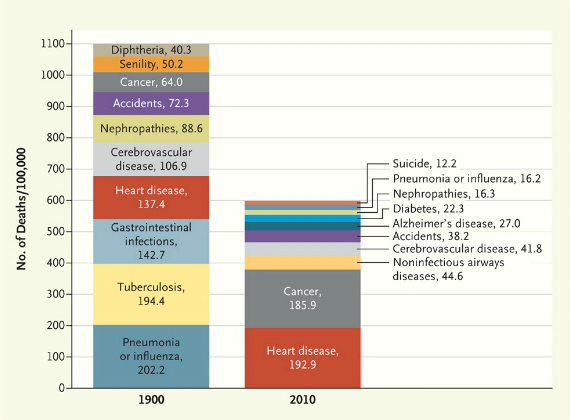 The size of the cancer and heart disease research communities reflects the present degree to which the two groups of conditions contribute to human mortality. What it does not yet reflect is the new and more meaningful unified way of looking at the conditions that kill the most people: that they are all caused by aging, and stem at root from a limited range of mechanisms and changes that happen over the years as a byproduct of our normal metabolism. We rust, and that rust blossoms into a thousand different failure modes. Yet medical science is still largely focused on end states, and patching over catastrophic damage rather than preventing its origins. To keep reducing the human mortality rate, the research community has to start in on prevention in the form of repair biotechnologies - ways to halt and reverse the earliest development of the age-related conditions that kill most people. It is as much a cultural change in the life sciences as it is a technical challenge, as the path ahead is fairly clear. This is why organizations like the SENS Foundation, mixing aggressive advocacy with targeted research work where few others are making progress, are so important. It is not so much that they will get the work done by themselves, but that they will spawn a sea change in the research community, such that many, many groups will tomorrow be performing similar work with similar end goals: to to be able to treat and reverse the course of aging. You might think of a focus on aging and its causes as the germ theory of today's medical community: a unifying set of ideas and resulting research strategies that will bring the bulk of the medical community onto a better path forward, one that will lead to a more rapid improvement in the human condition, and longer, healthier lives for all. If you can raise money for books, art projects, and widgets, why not for discrete life science research projects with determined goals? The LongeCity (previously the Immortality Institute) crowd have been trying this for some years, with a great deal of success considering the limited audience of this community in comparison to the audience available through Kickstarter. It is sad but true that far more people are brought to a state of excitedly opening their wallets for the development of an iPhone widget than for any sort of biotechnology project, even one that will contribute to the reversal of aging. What we can hope for from this wealth of effort is that some groups figure out the magic formula that will make science funding work in this environment - and make it work with the same degree of liquidity and interest as in commercial projects. Experimentation is clearly needed, however. The basic point of divergence between crowdfunding a product versus crowdfunding research is that in the former case the funders are definitively buying something concrete: that is their motivation and incentive. They are putting down money in expectation that what they are doing is submitting a preorder. Variations on the preorder theme are legion, but they all boil down to paying for a definitive item, a which will usually have fairly solid delivery date. Scientific research is notoriously bad when it comes to delivering on both those points, however. The work that is most amenable to crowdfunding consists of small projects that only incrementally add value to their fields - and which may not even do that, given the necessarily high failure rate for research. The challenge facing science crowdfunding is the same challenge faced by scientific advocates at all times: they do their part to grow communities of supporters and encourage those supporters to pay for research work. That work will give no immediate result, the eventual result may be hard for supporters to understand, it will likely not benefit them for some time, if ever, and in addition to all of that the undertaking will quite likely fail. Science is a high risk endeavor, with few short-term payoffs that people find rewarding - and thus it is a hard sell when held up against the allure of immediate gratification, candy, and shiny objects. But technological progress is the only thing that matters, not today's pretty baubles that are made possible by past successes in science. Funding of science has to be made to work if we want to continue on this upward curve to longevity, wealth, and expansion of what it means to be human. Despite all of the challenges, the old messy, organic way of funneling money into scientific projects does in fact make progress. People who care about the end result, something decades away, do step up to fund science. You might look at our little community of longevity science enthusiasts for example, making noise and raising somewhere north of $14 million over the past eight years for organizations and initiatives like the Methuselah Foundation, the New Organ Prize, and the SENS Foundation. Knowing that this is possible, and regardless of the fact that it is hard, very hard, to convince people to open their wallets for science, you have to look at what's happening in the crowdfunding space right now and think that fundraising for science could all be made easier - if someone just goes about it in the right way, builds the right tools, hits the right business model, pulls together the right sort of seed community. And maybe so. I've watched most of a decade of a small community funding research, and the cryonics advocates have watched much the same thing for far longer, but I don't have any good answers - and I'm not sure that they do either. So it is a good thing that a number of venture funded and bootstrapped groups are working on this; they'll have a few years of runway to work on finding the key to the problem, and we'll all benefit should one of them come up with a good way forward. A fellow that you met today will, forty years from now, have an entirely artificial immune system. It is an early model, a prosthetic replacement that is a mix of synthetic cells and less organic medical nanomachines, and requires frequent work and an open data channel to keep in line. Obtaining it wasn't a choice - it is a new treatment for a small class of acquired autoimmune conditions that somehow manage to persist through complete removal and replacement of immune cell populations. It works; he doesn't get sick, at all. Ever. Nonetheless, you shook this man's hand today. That future lies in waiting. Earlier you passed by a kid who will outlive you, your plans, your memory, your immediate descendants, and the first phase of terraforming to take place on Mars. The young have it good these days: a solid eighty years of probable-worst-case life expectancy at birth that will take them well into the first age of radical life extension - and that even if the next twenty years take us through a miserable economic depression coupled with a spread of repressive regulatory regimes that effectively stifle life science research and its application. Many of the youngest children of today will live for centuries, and many of those will go on to live for thousands of years. You walked right by that kid. In fairness, he doesn't know either, of course. Then there's that new face at the office, fresh out of college: by the 2070s she'll be a shell of the person she was. A happy shell, however, the original exterior polished up by gene, cell, and enzyme therapies to minimize the changes of aging in skin and musculature, but all of the interior organs below the neck new from labs in Thailand and Vietnam over the years, grown from her own genetic material. That took money, even though it's second string organ biotechnology by that time - but the sharp average worker you can save enough to afford that sort of thing over a lifetime. It's not as though she'll be retiring any time soon, and better low on funds than living like a 80-year old from a century past. That probably didn't cross your mind today when the two of you happened to be in the same meeting. The point here is this: the next half century is shaping up to be a transformation to match the last, but this time in biotechnology and medicine as well as in computing. These little snapshot nascent futures are no different than my 1960s analog describing to you the future of a then-20-something-and-now-70-something individual: surrounded by monitors; in touch with distant corners of the world at the click of a button; the world's encyclopedias and research institutions available at a moment's notice; living drenched in a wealth of knowledge, and connected to half the world's population in near-instant communication; possessing such massive reserves of computation power that enormous multi-machine simulations run for little more than entertainment value; connected to this web of knowledge and communication by radio, microwave, and pocket-devices that can be used near anywhere; amidst a sea of surging culture, charged by a hundred million voices all talking at once. This is an age of change, and much lies ahead of us. The potential for what sounds like science fiction - radical life extension, artificial organs and bodily systems, the defeat of disease and aging - lies nascent and dormant, awaiting those who will carve it from the passage of time, who will do the work to make these dreams a reality. A fair number of research groups are working to develop a technology platform for effective and rapid nerve repair. One of the many parallel lines of research involves the use of Schwann cells, a part of the supporting infrastructure for the nervous system. As for much of the field of regenerative medicine, work has progressed through stages of increasing sophistication: learning how to isolate and culture useful cells, and then introducing those cells into damaged areas, or incorporating them into existing therapies. Peripheral nerve injuries are a frequent and disabling condition, which affects 13 to 23 per 100,000 persons each year. Severe cases, with structural disruption of the nerve, are associated with poor functional recovery. The experimental treatment using nerve grafts to replace damaged or shortened axons is limited by technical difficulties, invasiveness, and mediocre results. Other therapeutic choices include the adjunctive application of cultured Schwann cells and nerve conduits to guide axonal growth. The bone marrow is a rich source of mesenchymal cells, which can be differentiated in vitro into Schwann cells and subsequently engrafted into the damaged nerve. Cell-based therapy associated with scaffolds is a promising branch of regenerative medicine. ... The idea of using nerve conduits filled with bone-marrow mesenchymal cells may be an attractive alternative to more aggressive therapies. If successful, the treatment may lead to functional improvement, avoiding the hurdles of additional surgeries and use of immunosuppressive drugs. A hypothetical scenario would be a patient with a traumatic limb injury, including extensive and severe damage of a motor nerve, resulting in acute disability. There would be a nerve gap, precluding any attempt of direct nerve suture. The use of a nerve conduit filled with allogeneic bone marrow-derived MSCs would be proposed, as an alternative to the standard autologous nerve graft implant. The acute nature of the condition would require a readily available source of cells, and since MSCs are immunoprivileged, indicating poor alloimmune response and therefore delayed rejection, allogeneic sources would be ideal. The cells would be already isolated from donated bone marrow, expanded in culture without further manipulation, tested for safety and quality, cryopreserved and ready for clinical use. The necessary amount of cells would then be thawed and inserted into biodegradable nerve conduits, readily implanted between nerve stumps during microsurgery. The therapy would require no immunosuppression and sequential functional and electromyographical evaluations would determine the outcomes. Expected results would be axonal repair, remyelination, and progressive functional improvement, either through differentiation of the transplanted into Schwann-like cells or, most probably, through paracrine effects of the bone-marrow-derived MSCs on the proximal axonal stump and remaining endogenous Schwann cells, stimulating regeneration. It is interesting to note that there are areas of stem cell medicine in which cell transplants from other people are just as useful as autologous cells obtained from the patient, this being one of them. So there is less of a motivation in this line of work to develop the techniques of culturing patient cells versus the long-established use of donor tissue. You might recall that I've mentioned the Brain Preservation Prize as a worthy endeavor. Research prizes are in general a very effective means of spurring progress in fields that would not otherwise move all that much. Sufficiently accurate preservation of the brain ties in to a range of topics important to those of us interested in radical life extension - such as how to help the billions who will die prior to the emergence of effective and widespread medical technologies capable of reversing aging. The nonprofit Brain Preservation Foundation (BPF) hereby officially announces a cash prize for the first individual or team to rigorously demonstrate a surgical technique capable of inexpensively and completely preserving an entire human brain for long-term (more than 100 years) storage with such fidelity that the structure of every neuronal process and every synaptic connection remains intact and traceable using today's electron microscopic (EM) imaging techniques. Our first team, led by Shawn Mikula (working in the laboratory of Winfried Denk at the Max Planck Institute in Heidelberg), has developed a whole mouse brain chemical preservation and plastic embedding technique. ... As part of the Brain Preservation Technology Prize competition, Dr. Mikula has agreed to demonstrate the quality of ultrastructure preservation which his protocol can achieve. ... 21st Century Medicine's main research has been focused on the cryopreservation of transplantable organs (kidney, heart) and toward decreasing the toxicity of the process to such organs. However, as part of the Brain Preservation Technology Prize competition, they have agreed to demonstrate the quality of ultrastructure preservation that their low temperature vitrification technique can achieve when applied to whole rabbit brains. I see that economist Robin Hanson of Overcoming Bias is in favor of this initiative, as one might expect from his views on cryonics. The biggest single charity donation I've made so far is ~$100. But now I'm donating $5000 to an exceptionally worthy cause. And I suggest you donate too. Here's my cause: People who "die" today could live again in the future, perhaps forever, as brain emulations (= uploads, ems), if enough info were saved today about their brains. I don't understand why the cryonics community isn't already all over this. To express my opinions to them more forcefully, I offer to bet up to $5K that plastination is more likely to win this full prize than cryonics. That is, if plastination wins but cryonics fails, I win the bet, and if cryonics wins but plastination fails, I lose. If they both win or both fail, the bet is called off. Any takers? Hanson would be far from the only person to have doubts as to the viability of cryonics, either from an organizational or technical perspective - though he really should use "vitrify" in place of "freeze", as that is what cryonics organizations do these days. Quite different. My own opinions on the matter are that plastination is well worth exploring - but I would expect any plastination-based community initiative to take a few decades to come to some form of stability and sort out its presently unforseen technical issues. Just because you don't need liquid nitrogen doesn't mean you can handwave away costs and challenges in long term storage. Do insects or forms of microbe like to eat any of the known plastination compounds, for example? Does storage in need to be maintained in a regulated temperature range to preserve structure for the long term? Either of those immediately raises both costs and risks considerably. Cryonics as an industry has the big advantage of having already demonstrated decades of staying power. That said, it is of course the case that more exploration and more competition is always better. The same is true for technical validation and bulletproofing of the technologies presently used in cryonics. Competition drives progress to a greater degree than aspiration: humans move when they must more than when they want to. I should also note that, as is often the case in these matters, Hanson's commentary touches on whether a copy of your mind is you. I say no, which is one of the reasons to go into cryopreservation with a tattoo or other permanently attached note to say "Do not copy, restore the original." Copying of a preserved mind is likely to be somewhat easier, so will probably happen unless you ask for some other option. Calorie restriction (CR), which deactivates the nutrient-sensing mTOR pathway, slows down aging and prevents age-related diseases such as type II diabetes. Compared with CR, rapamycin more efficiently inhibits mTOR. Noteworthy, severe CR and starvation cause a reversible condition known as "starvation diabetes." [and] chronic administration of rapamycin can cause a similar condition in some animal models. ... Here I introduce the notion of benevolent diabetes and discuss whether starvation-like effects of chronic high dose treatment with rapamycin are an obstacle for its use as an anti-aging drug. [You] might wonder whether rapamycin extends lifespan despite or because of "starvation-like diabetes". ... Rapamycin, which inhibits mTOR, is a "starvation-mimetic", making the organism "think" that food is in a short supply. The most starvation-sensitive organ is the brain. The brain consumes only glucose and ketones. Therefore, to feed the brain during starvation, the liver produces glucose from amino acids (gluconeogenesis) and ketones from fatty acids (ketogenesis). Since insulin blocks both processes, the liver needs to become resistant to insulin. Also secretion of insulin by beta-cells is decreased. And adipocytes release fatty acids (lipolysis) to fuel ketogenesis by the liver. Thus, there are five noticeable metabolic alterations of starvation: gluconeogenesis, ketogenesis, insulin resistance, low insulin levels and increased lipolysis. This metabolic switch is known as starvation diabetes, a reversible condition, described 160 years ago. Starvation-diabetes is not a true type II diabetes. Type II diabetes is a consequence of insulin-resistance in part due to excessive nutrients and obesity. ... Type II diabetes and starvation diabetes seem to be the two opposite conditions: the first is associated with activation of nutrient-sensing pathways, whereas the second is associated with deactivation of nutrient sensing pathways such as mTOR. Type II diabetes is dangerous by its complications such as retinopathy, neuropathy and accelerated atherosclerosis and cancer. Long-term effects of prolonged "starvation diabetes" is not known of course: it could not last for a long time, otherwise an animal (or human) would die from starvation. Or would not? ... Among individuals who had been practicing severe CR for an average of 7 years, 40% of CR individuals exhibited "diabetic-like" glucose intolerance, despite low levels of fasting glucose, insulin and inflammatory cytokines as well as excellent other metabolic profiles. In comparison with the rest CR individuals, they had lower BMI, leptin, circulating IGF-I, testosterone, and high levels of adiponectin, which are key adoptations to CR in rodents, suggesting severe CR. Metabolism is a complex thing, is it not? The benefits of calorie restriction in humans are legion, per the research to date, and it's well worth your time to look into it and give it a try. Heart health vastly improved, near every measure of aging slowed, greater resistance to age-related diseases, and much more - far more than any medical technology can yet accomplish for a basically healthy individual, in fact. Whole brain emulation is the topic for today: being able to run all of the processes of a brain on some form of computing machinery other than the evolved biological structures we presently possess. Considered in the long term this is an important line of research, as radical life extension will ultimately require moving away from flesh and into some more robust form of machinery in order to better manage the risk of fatal accidents. 'Ultimately' here is a long way into the future, centuries or more, long after we have solved the basic problems of repairing our aging biology so as to attain continual youth. Some people will be satisfied with copying themselves from their biological substrate into a machine substrate and letting that machine copy continue on, but that seems to me little more than an expensive form of procreation - continuation of the self requires a slow transformation of the original, not a quick cut and paste of data to a new computing device. But this is an old and often rehashed argument between identity as pattern and identity as continuity. Regardless of how people decide to use the ability to host a conscious individual somewhere other than a human brain, the technologies of whole brain emulation will have to be built. They are a precursor to any program of replacing the brain's present biological machinery with something better. From where I stand, brain emulation is also the most plausible path to true artificial intelligence, which at this time looks far more likely to arise from attempts to duplicate and then improve on the operation of human brains than from efforts to improve expert systems of varying sorts. Reasonable people differ on this, of course, as even a brief survey of publications on artificial intelligence will tell you. Neuronanorobotics, a promising future medical technology, may provide the ultimate tool for achieving comprehensive non-destructive real-time in vivo monitoring of the many information channels in the human brain. This paper focuses on the electrical information channel and employs a novel electrophysiological approach to estimate the data rate requirements, calculated to be (5.52 ± 1.13) × 10^16 bits/sec in an entire living human brain, for acquiring, transmitting, and storing single-neuron electrical information using medical nanorobots, corresponding to an estimated synaptic-processed spike rate of (4.31 ± 0.86) × 10^15 spikes/sec. Transhumanists tend to have a commitment to materialism and naturalism but nonetheless pursue goals traditionally associated with religious ideologies, such as the quest for immortality. Some hope to achieve immortality through the application of a technology whereby the brain is scanned and the person "uploaded" to a computer. This process is typically described as "transferring" one's mind to a computer. I argue that, while the technology may be feasible, uploading will not succeed because it in fact does not "transfer" a mind at all and will not preserve personal identity. Transhumanist hopes for such transfer ironically rely on treating the mind dualistically - and inconsistently with materialism - as the functional equivalent of a soul, as is evidenced by a carefully examination of the language used to describe and defend uploading. In this sense, transhumanist thought unwittingly contains remnants of dualistic and religious concepts. I outline some recent developments in the field of neural prosthesis concerning functional replacement of brain parts. Noting that functional replacement of brain parts could conceivably lead to a form of "mind-substrate transfer" (defined herein), I briefly review other proposed approaches to mind-substrate transfer then I propose a framework in which to place these approaches, classifying them along two axes: top-down versus bottom-up, and on-line versus off-line; I outline a further hypothetical approach suggested by this framework. I argue that underlying technological questions about mind-substrate transfer, there is a fundamental question which concerns our beliefs about continuity of identity. On this last topic, present developments in neural prosthetics are well worth the time taken to investigate. Being able to replace some lesser pieces of the brain in the event of damage is on the verge of being a going concern - sometime within the next twenty years there will be a fair number of people walking around with implanted medical devices in their brains. Those devices will replace or augment the function of one or more component parts of the brain, allowing these patients to live where they would otherwise have died or suffered a lower quality of life. This is the start of the next wave of mapping the physical structure of the brain to its function, and that field of research will expand and accelerate just like all other areas of medicine, driven by the ongoing biotechnology revolution. Sarcopenia is the umbrella name for the progressive loss of muscle mass and strength with age - which may turn out to cover a range of separate mechanisms. The progression of sarcopenia appears to be reduced by the practice of calorie restriction, and might also be slowed by a range of possible therapies such as exercise and dietary leucine supplementation or targeting the myostatin gene and its protein product. Levels of inflammation also show up as a possible contributing factor - more chronic inflammation is a bad thing across the board. Here is an open access paper that touches on much of what the mainstream research community is investigating when it comes to sarcopenia. Sarcopenia, the age-related loss of skeletal muscle, is characterized by a deterioration of muscle quantity and quality leading to a gradual slowing of movement, a decline in strength and power, and an increased risk of fall-related injuries. Since sarcopenia is largely attributed to various molecular mediators affecting fiber size, mitochondrial homeostasis, and apoptosis, numerous targets exist for drug discovery. In this paper, we summarize the current understanding of the endocrine contribution to sarcopenia and provide an update on hormonal intervention to try to improve endocrine defects. Myostatin inhibition seems to be the most interesting strategy for attenuating sarcopenia other than resistance training with amino acid supplementation. Several researchers have investigated the effect of inhibiting myostatin to counteract sarcopenia using animals. Lebrasseur et al. found that treatment with a mouse chimera of antihuman myostatin antibody (24 mg/Kg, 4 weeks), a drug for inhibiting myostatin, elicited a significant increase in muscle mass and in running performance ... More recently, Murphy et al. showed, by way of once weekly injections, that a lower dose of this anti-human myostatin antibody (10 mg/Kg) significantly increased the fiber cross-sectional area (by 12%) and in situ muscle force (by 35%) of aged mice (21 mo old). These findings highlight the therapeutic potential of antibody-directed myostatin inhibition for sarcopenia by inhibiting protein degradation. Work on myostatin therapies is one of the topics worthy of greater attention here, as this seems like it would be a generally beneficial gene therapy for everyone - something that, given a good safety profile, most people would want to undergo earlier in life. The first step towards widespread availability for this sort of human enhancement is to develop the necessary medical technology in in the first place, of course, and these days that's only going to happen in the service of treating a specific medical condition. DNA methylation is a part of epigenetics, one of the mechanisms by which protein machinery produced from DNA creates feedback loops to change the production levels of many different proteins. Genes are decorated with a continually altering array of chemical signals, changing with circumstances and environment. The cell nucleus is a factory, DNA the component blueprints, and DNA methylation one portion of the chaotic parts order list: from moment to moment, how much to make of each piece of protein machinery encoded in the genome. DNA methylation changes with age, location within the body, and type of cell, a fuzzy and very complicated pattern of decorated genes. Some of the myriad changes are sufficiently similar from person to person to be a possible method to determine age quite accurately. Others are known to reflect the degree to which a person becomes frail with age. Many more are not understood at all, or may be largely random. A great many debates within aging science revolve around the difference between cause and consequence - and so too with DNA methylation. Is it a part of the expected attempts by the body to adapt to increasing levels of cellular damage caused by aging, or is at least some alteration in DNA methylation a form of damage in and of itself? Good arguments can be made either way, but for my money I'd be surprised to see significant levels of epigenetic changes that were anything other than the results of underlying damage and evolutionary adaptations that try (and ultimately fail) to cope with that damage. This debate is significant, of course, because of how it directs research and development funding. Will scientists try to patch over the root causes of aging by altering its secondary effects - inevitably doomed to be expensive and comparatively ineffective - or will they work to repair the true causes, and thereby remove the secondary effects for free? There's been a great deal too much work on patching over the cracks in the medicine of past decades, and in this age of biotechnology it seems a sin to continue that way when we don't have to. An important element of the DNA is what is known as the epigenome. This refers to the pattern of added chemical tags on the DNA called methyl groups. These tags may alter the expression of genes near or on which they reside. Usually they turn off expression of the gene on which they reside. A team of researchers decoded and compared the entire epigenome from blood cells in a neonate, a 26 year old, and a 103 year old. The results were striking. The researchers discovered that as the cells aged, the epigenome changed dramatically. They found 80% of all cysteine residues were methylated in the newborn compared to just 73% of them in the centenarian. A 26 year old subject had 78% of them methylated. They also found almost 18,000 locations in the genome where methylation varied the most. About one third of those regions occurred in genes linked to increase risk of cancer. Mostly aging involved loss of methyl groups. The researchers analyzed the genome of the baby's white blood cells (obtained from cord blood). They found more than 16 million spots where methyl groups had been attached to the baby's DNA. But when they did the same thing with the old man's DNA (obtained from his white blood cells), they found nearly 500,000 fewer sites with methyl groups attached. The sites weren't as densely methylated either. The scientists got a similar result when they looked in a larger group of 19 Caucasian newborns and 19 Caucasian nonogarians (average age 92.6). And they found an intermediate level of methylation when they examined the white-blood-cell DNA of 19 middle-aged people (average age about 60). The scientists went on to take a closer look at a few specific genes where they'd spotted changes in methylation in their samples and found that the activity of the genes that had been depleted in methyl groups was, indeed, changed. And they noted that some of the genes - such as two called Sirtuin 5 and Sirtuin 7 - are thought from other studies to be involved in the biology of aging. As I said above, I don't think epigenetic changes have much to say about why we age, as they are not a fundamental change. They may encode many of the details of how we age, however - ways in which low-level damage translates into characteristic changes in the way that cells, systems, and organs operate. This may be very valuable, but equally it doesn't change the basic goal, which is to repair the fundamental forms of damage that drive aging. Pitch dark, dank, and seething with saber-toothed, sausage-shaped creatures, the world of the African naked mole-rat is a hostile habitat. In the 1980s, scientists made the remarkable discovery that naked mole-rats live like termites with a single, dominant breeding queen and scores of nonbreeding adult helpers that never leave their natal colony. But the bizarreness doesn't stop there. Naked mole-rats, unlike other mammals, tolerate variable body temperatures, attributed to their lack of an insulatory layer of fur. Their pink skin is hairless except for sparse, whisker-like strands that crisscross the body to form a sensitive sensory array that helps them navigate in the dark. Both the naked mole-rat's skin and its upper respiratory tract are completely insensitive to chemical irritants such as acids and capsaicin, the spicy ingredient in chili peppers. Most surprisingly, they can survive periods of oxygen deprivation that would cause irreversible brain damage in other mammals, and they are also resistant to a broad spectrum of other stressors, such as the plant toxins and heavy metals found in the soils in which they live. Unlike other mammals, they never get cancer, and this maintenance of genomic integrity, even as elderly mole-rats, most likely contributes to their extraordinarily long life span. In contrast to similar-size mice that only live 2-4 years, naked mole-rats can survive and thrive, maintaining normal function and reproduction, into their 30s. From my perspective, naked mole rat research is likely to be more important for the cancer research community than for longevity science; their cancer resistance might be largely a matter of different behavior in a single gene, which gives researchers a clear target for investigation. On the longevity front, at this point it looks probable that naked mole rats are walking confirmations of the pacemaker membrane hypothesis, showing that the resilience of mitochondria to damage is very influential in determining life span. That doesn't mean we should try to make our mitochondria look like those of the naked mole rat, however - that would be enormously challenging, a massive undertaking. Instead, we should prioritize presently ongoing research aimed at repairing mitochondria. We don't need better mitochondria if we can walk into a clinic and have all of their damage repaired every decade or two. This is in fact an expression of the general argument against all attempts to slow aging by changing human metabolism or the make up of our biochemistry. It will be very hard, and it will bring little benefit. Working on ways to repair the biology we have is a far better strategy, a goal that will be less expensive to achieve, and will produce a far superior result. The liver is likely to be one of the earliest human organs grown to order from a patient's stem cells: liver tissue is already far more capable of regeneration than the tissues of other organs, and researchers have been making good progress in recent years in coaxing stem cells to form live tissue. As of today, a press report is doing the rounds to claim that a Japanese group have managed to grow a small functional mass of liver tissue - calling it a liver is no doubt considerably overstating the case, given the small size. Details are somewhat light on the ground, but we'll no doubt hear more soon. Japanese researchers have created a functioning human liver from stem cells, a report says. ... A team of scientists transplanted induced pluripotent stem (iPS) cells into the body of a mouse, where it grew into a small, but working, human liver, the Yomiuri Shimbun said. A team led by professor Hideki Taniguchi at Yokohama City University developed human iPS cells into "precursor cells", which they then transplanted into a mouse's head to take advantage of increased blood flow. The cells grew into a human liver 5 millimetres (0.2 inches) in size that was capable of generating human proteins and breaking down drugs, the Yomiuri reported. An abstract of Taniguchi's research was delivered to regenerative medicine researchers ahead of an academic conference next week, but Taniguchi declined to comment to AFP before the meeting. One of the major obstacles in regenerating thick, complex tissues such as the liver is their need for vascularization, which is essential to maintain cell viability during tissue growth and to induce structural organization. Herein, we have described a method to engineer a functional human vascular network. Vascularization is the key challenge to organ generation. We successfully generated human vascular networks inside a matrix. Integration of parenchymal cells using our engineering technique should facilitate future efforts to reconstitute vascularized human organ systems in vitro. Researchers interested in finding genetic contributions to longevity generally start with some form of correlation study: trying to find commonalities between the genomes and epigenomes of long-lived individuals. So far, this has produced a great deal of data, much of which is unique to particular study populations - which suggests that there are many, many contributions to longevity buried in human genetic variations, and most are not all that important when considered in isolation. The odds of finding anything resembling a master switch for additional life span look remote at this point. It is a stroke of irony that lifespan - the principal phenotype used to search for aging genes - is a terrible phenotype for genetic analysis. Lifespan has relatively low heritability under most conditions, and it is affected by chronic, age-related diseases that confound its use as a biomarker of aging. If the majority of aging genes are pleiotropic, as proposed by the evolutionary theory of aging, an opportunity is provided to identify these genes through the "back door," using phenotypes that are more amenable to genetic analysis. To choose the pleiotropic phenotype for our studies, we went back more than 50 years to Williams, who, in his seminal paper, specified four "physiological expectations that follow from the theory," two of which we applied: "Rapid individual development should be correlated with rapid senescence," and, to specify a particular developmental phenotype, "The time of reproductive maturation should mark the onset of senescence." Therefore, to search for genes that regulate lifespan, we looked in the other direction - for genes that govern reproductive maturation. The researchers then outline some of their investigations; when it produces candidate genetic variants, those variants still have to be confirmed in the same old standard, slow, and laborious way - animal studies of life span. In general the work of building a catalog of aging-related gene variants is slow going, and in the end will have far less practical application than other approaches to longevity science. This isn't to say that it shouldn't be done; all life science knowledge has value. But if the goal is to do something about the terrible cost of human aging, and do it as soon as possible, then approaches other than genetic investigation must have priority in the field. You might recall research published a couple of months ago on calorie restriction and heart function. It illustrated (again) that people who practice calorie restriction over the long term have physiologically younger cardiovascular systems - meaning notably less low-level cellular damage and better function than their peers of a similar chronological age. Heart rate variability (HRV) is a marker for cardiac autonomic functioning. The progressive decline in HRV with aging and the association of higher HRV with better health outcomes are well established. [Researchers] compared 24-hr HRV in 22 CR individuals aged 35 - 82 yrs and 20 age-matched controls eating Western diets (WD). The CR group was significantly leaner than the WD group. Heart rate was significantly lower, and virtually all HRV significantly higher in the CR than in the WD group. HRV in the CR individuals was comparable to published norms for healthy individuals 20 years younger. If there was a drug that did that, its financials would be staggering - and you'd never hear the end of it. It would be publicized and popularized in every corner of the world. But just ask someone to exercise a little willpower and planning in their diet to gain the same results ... and therein lies a lesson with regard to human nature. "This is really striking because in studying changes in heart rate variability, we are looking at a measurement that tells us a lot about the way the autonomic nervous system affects the heart," says Luigi Fontana, MD, PhD, the study's senior author. "And that system is involved not only in heart function, but in digestion, breathing rate and many other involuntary actions. We would hypothesize that better heart rate variability may be a sign that all these other functions are working better, too." "Higher heart rate variability means the heart can adjust to changing needs more readily," says lead author Phyllis K. Stein, PhD. "Heart rate variability declines with age as our cardiovascular systems become less flexible, and poor heart rate variability is associated with a higher risk of cardiovascular death." "The idea was to learn, first of all, whether humans on CR, like the calorie-restricted animals that have been studied, have a similar adaptation in heart rate variability," Fontana says. "The answer is yes. We also looked at normal levels of heart rate variability among people at different ages, and we found that those who practice CR have hearts that look and function like they are years younger." "In many of our studies, we have found that a number of metabolic and physiologic changes that occur in calorie-restricted animals also occur in people who practice CR," Fontana says. And he says the finding that heart rate variability is better in people who practice CR means more than just that their cardiovascular systems are flexible. He says the better ratio suggests improved health in general. "But we can't be absolutely positive that the practice of CR is solely responsible for the flexibility of the cardiovascular system," Stein says. "People who practice CR tend to be very healthy in other areas of life, too, so I'm pretty sure they don't say to themselves, 'Okay, I'll restrict my calorie intake to lengthen my life, but I'm still going to smoke two packs a day.' These people are very motivated, and they tend to engage in a large number of very healthy behaviors." The point on calorie restriction practitioners practicing good health across the board is a fair one - peeling apart the beneficial effects of regular exercise from the beneficial effects of calorie restriction in humans, for example, is an interesting challenge. Still, it would be hard, I think, to find a population of humans who are exceptionally health-conscious without practicing calorie restriction and who nonetheless exhibit a youthful physiology to the degree seen in calorie restricted people. There are different classes of mechanism at work here. Microglia are immune cells that defend and clean up the brain and spinal cord. Like the rest of the immune system, they progressively fail in their work with age. Worse, like other immune system components, they begin to become actively harmful by causing chronic inflammation and other forms of damage instead of helping. Reversing that trend is one important line of research among many that, as they produce working medical technologies, will extend our healthy life spans. Keeping the brain in good working shape is one of the most important goals of medical research. There is no short cut here by way of the comparatively advanced fields of stem cell medicine and tissue engineering - we can't look ahead to replacement brains in the next decade or two as we can for other organs. The brain has to be repaired in situ, completely and sufficiently for the long term: every form of age-related cellular damage either worked around or reversed. So microglia, as an important part of the existing maintenance systems in the brain, are of considerable interest. Can early successes be obtained by boosting their activity, or slowing or reversing their decline with age? The Longecity-funded research project on microglia transplants falls into this general area of research - something we'd like to see more of. For many years, chronic neurodegenerative disorders of the central nervous system (CNS) were thought of in terms of primary neuronal dysfunction and loss with secondary glial and inflammatory responses. ... but of late this theory has required revision. Microglia, which account for approximately 10% of the adult brain cell population, were first described by Pio Del Rio Hortega in 1919 ... However, it was not until the late 1980s that this field came of age when, using the new technique of immunohistochemistry, the McGeers showed that within the Alzheimer's disease (AD) brain there were large numbers of [activated] microglia. ... The pioneering work of the McGeers was to radically change how these diseases were seen as they went on to show that microglia were not only intimately bound to central inflammatory responses and antigen presentation, but in fact the whole innate immune system itself had a role to play in these CNS disorders. Initial views on the role of microglia suggested that these cells were simply there to scavenge up debris and dead cells, while astrocytes fulfilled some supportive role in the CNS. However, microglia are now recognized to have a complex array of supportive and destructive roles in the CNS and that the balance between the two may be critical in driving some aspects of disease processes. Astrocytes are now seen as being fundamental in shaping and maintaining the developing and mature CNS, including a role in adult neurogenesis, axonal regeneration, and the [blood-brain barrier]. The dynamic interplay between all of these different CNS compartments is becoming more evident, such that some neurodegenerative disorders of the CNS may have a pathology as much in the glial cells as in the neurons themselves. This all means that understanding what happens in disease states is far more complex than originally conceived and that targeting each element of the interaction may be the route by which true disease modification can be achieved. What Can You Achieve With Two Thousand Supporters? There are perhaps something on the order of 2,000 living cryonicists in the world, the majority of them in the English speaking/reading world. Of these, optimistically, perhaps 15% are technically/scientifically/philosophically oriented "activists" with an interest in the mechanics of cryonics, as opposed to people who have chosen cryonics as a service or product "as is," and are content to accept it without further improvement as a result of their own efforts. As I understand Darwin's chief concerns with cryonics as a whole, they amount to (a) that he doesn't like the way business is undertaken at Alcor and the Cryonics Institute, and, more importantly, (b) he thinks that there is a real risk of cryonics failing as a human endeavor in the future due to its lack of growth and comparatively narrow base of community support. What I'll here call hyperactivism is a poisonous sort of dysfunction that you'll find in activist and advocate communities associated with struggling industries or long-standing initiatives that have failed to fulfill early visions of growth. It comes about because the early supporters in any new field tend to be passionate, driven, ornery, and focused: if they didn't have these characteristics, they wouldn't be up for the job of fighting over and again to persuade people to see things their way. My take on dissatisfaction with existing practices in cryonics is this: if you feel strongly enough and are motivated enough to be one of the few who actually gets things done, and write what amounts to a book on the topic, then the best response is to start your own organization and do things differently. Or start a complementary, more narrowly focused organization that can addresses specific issues of concern and can make itself useful in the ecosystem. If I were sufficiently fired up about the present state of cryonics, I'd probably try to do better on the service provision side of the house: a luxury line of services, better customer service, or running a better middle man service to ease organization of the methods of payment through life insurance. That sort of thing. Clearly I'm not yet sufficiently fired up. Give it another decade and I'll be starting to weigh the balance of supporting cryonics versus supporting rejuvenation biotechnology a little more evenly. Time waits for no man. But let us talk about point (b) instead, the existential threat of cryonics declining and ultimately evaporating as an endeavor. To my eyes there is a legitimate concern about the robustness of cryonics over the long term - by which I mean more than a few decades out from here. Nothing happens without putting in the work, and it's easy enough to point out any number of sports, hobbies, and semi-professional scientific study groups of the past two centuries that came, occupied a niche for some decades, and left. As Darwin points out in a number of posts on the history of cryonics over the past four decades, it was a mere handful of people who turned early cryonics from a noble failure to a more rigorous branch of speculative medicine that was set up to run for decades. When it comes to robustness, you don't want to see things that succeed or fail based on a critical handful of people. You want to know that there are many parallel groups, all of whom will do just fine independently of one another, and who connect with one another to form a larger community. Nonetheless, based on the narrow history of cryonics we should expect the endeavor to last decades more simply by virtue of having lasted decades to date: there is a community, there are established centers and processes, there is a steady if slow pace of progress in improving the technology. Inertia works both ways. Certainly the present younger leadership will be going strong twenty years from now, and they were attracted to cryonics when it had a good deal less press and far more hostile press than is presently the case. I would be surprised if the next generation is any less capable. The real concern is not the foreseeable twenty to forty years ahead, however. It arises when you consider that, by its very nature, in order to succeed cryonics has to have a good chance of continuing to provide solid and unbroken cold-storage service for a century or more. I think that we'd all feel much more comfortable if those estimated 2,000 supporters were an estimated 20,000 supporters or 200,000 supporters when looking at that sort of timescale. Over the long term, it is all about risk: what is the risk of catastrophic failure for a small group versus a large group versus many equal small groups? Robustness over time consists of a lower risk of extinction resulting from any given set of accidents and random occurrences. What can you achieve with a community of two thousand people, most of whom are going to put in a good word or a few dollars here and there, but little more? For comparison, you might look at the SENS Foundation and Methuselah Foundation: their support base is probably quite similar in size. The funds raised there over the past eight years are largely a matter of record: something on the order of $12M to $14M by now. Neither of those ventures is going away any time soon. But equally there is much improvement to be had; more people, more funds, and more publicity are all needed. Cryonics providers are still small concerns - far more vital than their size indicates, which is par for the course in anything to do with extending human life at the present time. Researchers make paralyzed rats walk through a mix of chemical stimulation and structured physical therapy; only a little regrowth in the spine occurs, but the lower spinal column can take over some of the lost functionality under the right circumstances: "a severed section of the spinal cord can make a comeback when its own innate intelligence and regenerative capacity is awakened. ... After a couple of weeks of neurorehabilitation with a combination of a robotic harness and electrical-chemical stimulation, our rats are not only voluntarily initiating a walking gait, but they are soon sprinting, climbing up stairs and avoiding obstacles when stimulated. ... until now the spinal cord expressed so little plasticity after severe injury that recovery was impossible. ... under certain conditions, plasticity and recovery can take place in these severe cases - but only if the dormant spinal column is first woken up. To do this, [researchers] injected a chemical solution of monoamine agonists into the rats. These chemicals trigger cell responses by binding to specific dopamine, adrenaline, and serotonin receptors located on the spinal neurons. This cocktail replaces neurotransmitters released by brainstem pathways in healthy subjects and acts to excite neurons and ready them to coordinate lower body movement when the time is right. ... Five to 10 minutes after the injection, the scientists electrically stimulated the spinal cord with electrodes implanted in the outermost layer of the spinal canal, called the epidural space. ... a stimulated rat spinal column - physically isolated from the brain from the lesion down - developed in a surprising way: It started taking over the task of modulating leg movement, allowing previously paralyzed animals to walk over treadmills. These experiments revealed that the movement of the treadmill created sensory feedback that initiated walking - the innate intelligence of the spinal column took over, and walking essentially occurred without any input from the rat's actual brain. This surprised the researchers and led them to believe that only a very weak signal from the brain was needed for the animals to initiate movement of their own volition. ... newly formed fibers bypassed the original spinal lesion and allowed signals from the brain to reach the electrochemically-awakened spine. And the signal was sufficiently strong to initiate movement over ground." There is death and then there is information theoretic death - a person who is cryopreserved is a good deal less dead than someone who went to the grave. The fine structure and data of the mind still exist, in a cold-stored stasis, and thus might be restored through foreseeable future technology. Here are some notes on the legal situation with respect to cryopreserved people: "This article series seeks to compare the legal protection of cryonics patients under their present legal status to the legal protection which would be afforded them if they were recognized as persons under the law, thinking ahead to such future time as it becomes reasonably possible to put legal and political pressure towards enhanced legal recognition of cryonics patients. The previous article examined laws that directly affect what happens to a person's body after legal death, both in the period immediately after declaration of legal death, and indefinitely thereafter. We saw that the amount of prospective autonomy a person is permitted in this regard can vary significantly from jurisdiction to jurisdiction, with more or less consideration afforded to the wishes of the person's next of kin, religious beliefs, societal norms and other public interests. Two other legal structures which can and are used by cryonicists to promote the success and timeliness of cryopreservation, maintenance, and resuscitation are wills and trusts."